NGO Fundraising & CSR India: Fundraising for research may not need writing grant proposals. Discover how! Fundraising for research may not need writing grant proposals. Discover how! Some days back I had read an article in The Jakarta Post that talked about the meager funds that were put in for social research i.e. research that can help provide solutions for diseases, welfare services for poor and other social issues. The article had identified a very pertinent issue often plaguing the developing world- lack of investment in research. The article also urged support from government and listed some private philanthropists in Indonesia (like Tahir Foundation) that were already funding research in important public welfare areas. That set me thinking, the two sectors- government and private corporations have a responsibility to support research and therefore should be appealed for increasing spending. However, why is the alternative approach that was also used successfully by a famous global campaign not tried more often to raise funds for research. I am talking about The ALS Association's phenomenal "Ice Bucket Challenge". We all would recall how in the year 2014 it caught imagination of people around the globe and raised more than 220 million worldwide for various charities working on ALS (Amyotrophic Lateral Sclerosis) . Almost 77 million, 67% of the USD 115 million raised by The ALS Association in United States was used for supporting research. Why can't we use a similar approach? Although several look alike efforts like dirt bucket, rice bucket challenge etc. were not as successful, yet we need to deconstruct the mechanism used by the campaign and learn from it. The Ice Bucket Challenge did not go to public at large with piles and piles of data and an appeal to donate for ALS related research. They made people experience what it felt like suffering from ALS and asked them to contribute up to USD 100 each for discovering cure for ALS. The organisation then decided to use a majority of these funds for research. Last month, The ALS Association broke news that partly due to funds raised by Ice Bucket Challenge, the scientist were able to discover a new gene that is the most common contributor to the disease. This will ensure that going on drugs could be developed to address the effects of this newly discovered gene. So what we learn from this campaign is to make people experience the cause, show possible impact and ask for their contribution. You don't always need viral campaigns to do it, in fact The ALS Association was not able to repeat success by using same campaign in the following years. Even face to face fundraising can be used to raise funds for research. Do scroll up and look at the illustration. 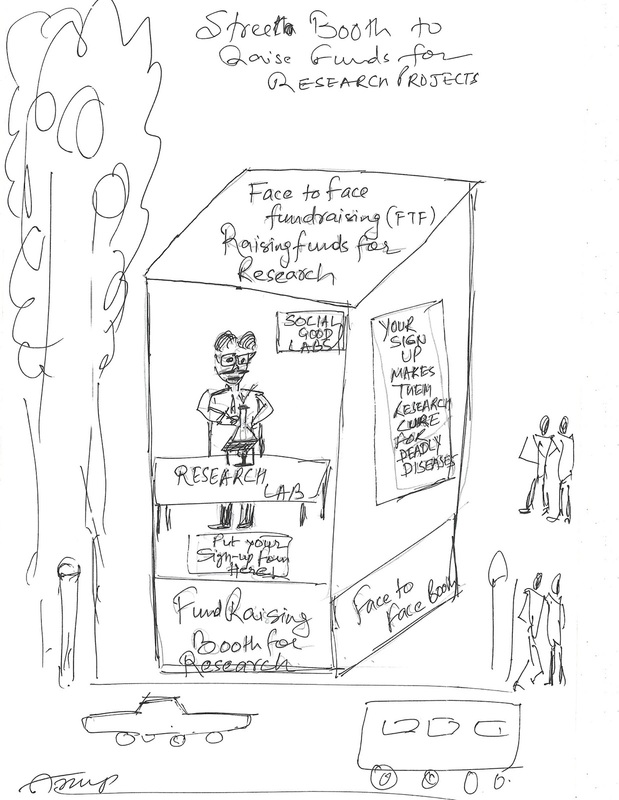 You may not have realised but it is a face to face fundraising booth that is raising funds for research. In this a scientist sits in the glass booth, which models a research lab. The scientist sits idle, but stands up and starts performing experiment once you put your donation form inside the box. This is just not a bright looking idea that will not work on the ground. In fact, Multiple Sclerosis a non-profit organisation in Australia had actually used a similar approach in its street fundraising effort. So, this goes on to show that the tools of fundraising from public at large can also raise funds for research. It is for more and more nonprofits and research institutes to adopt this mechanism of mobilising funds. One needs to showcase impact and benefits that research is likely to bring in a way people on the street can understand. Rest, that individual walking on the street has been and will remain generous, always.